We've updated the theming experience and UI described in this article. 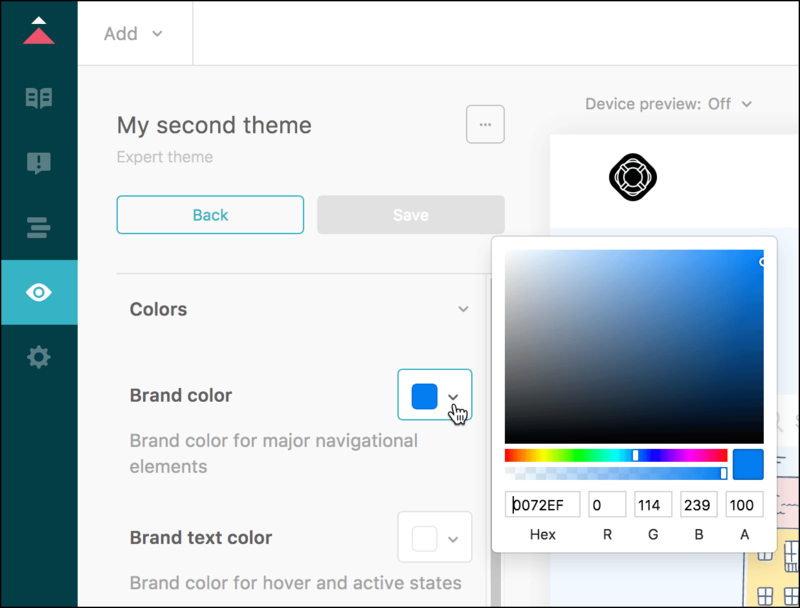 Customers who enabled Guide before November 14th can upgrade to the new theming experience. This guide describes the manifest file and what you can do with it. It also provides a reference of its specification. 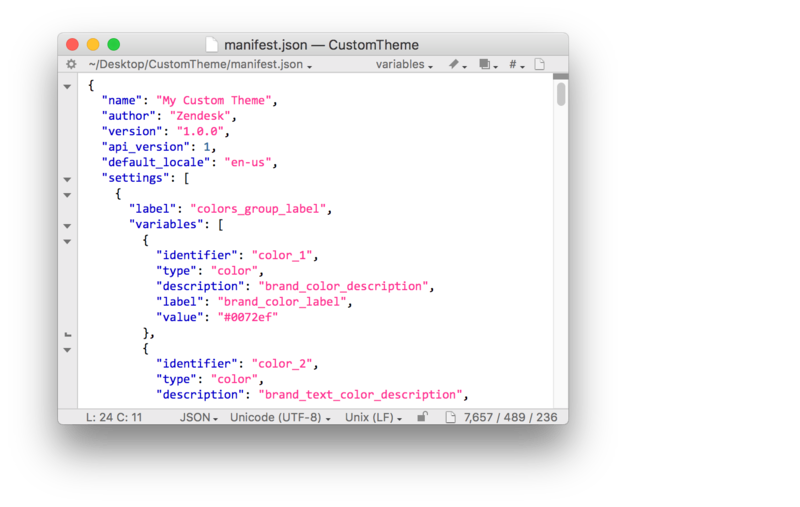 For an example, export your theme and open the manifest.json file in a text editor. When you export a theme, the exported files include a file named manifest.json. You can use the manifest file to define the theme's Settings panel in Guide. Settings are also called variables because you can use a setting's identifier as a variable in the theme's files. Changing a value in the Settings panel updates the value in all the files that use the variable. The manifest.json file is not included in the list of files in the Edit Code page in Help Center. To edit the manifest.json file, you must export the theme to files, make changes to the manifest file on your system, then import the theme in Guide. On the Themes page, click the gear icon on the lower right of a theme pane, and select Export. 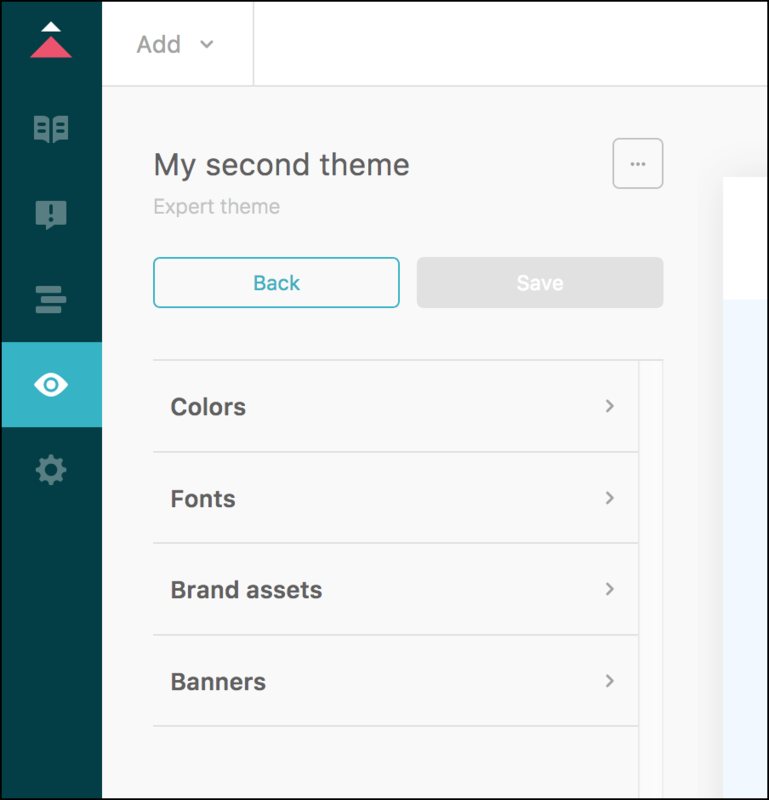 On the Themes page, click Import on the upper-right side. The settings in both the manifest root object and the Settings panel in Guide are organized into groups such as Colors or Fonts. Each setting group is defined in the manifest file by a setting object. Each object consists of a label and one or more settings, such as Brand Color and Text Color. You can modify setting objects or create your own. The objects are reflected in the theme's Settings panel when you import the theme in Guide. Note: The value of the "label" properties are translation property names. See Translations. Each setting object has a variables array that lists the actual settings. They're called variables because you can insert them as variables in Help Center templates or in CSS. You can define any variable you want. 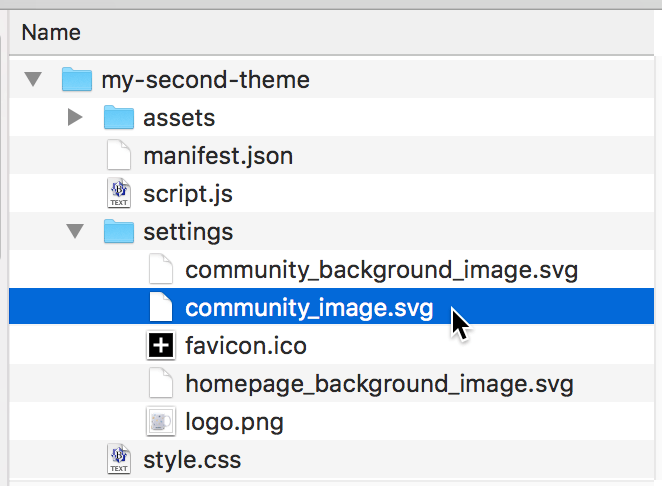 However, the manifest file must contain two file variables with the following identifiers: "logo" and "favicon". See Required variables. logo - the identifier must be "logo" and the type must be "file"
favicon - the identifier must be "favicon" and the type must be "file"
You must specify more than one option in the array or importing the theme will fail. If the type of a variable object is "checkbox", use the object's value property to specify the value that's set when the user selects the checkbox. The value must be a boolean. The value is a file URL determined by the system. A range variable includes a min and a max property to specify the range of values that the user can set when they move the slider. The values must be integers. The property names are arbitrary. You can specify any name you like. The translations are used to specify the labels and descriptions in the Settings panel. In the translations folder, locate the JSON file for the default language of your Help Center. Example: en-us.json. In variables, use the translation property name as the value of "label" or "description" attributes. See Variable object. If you create a property or change a property name, make sure to update your variables. You can localize the labels and descriptions in the Settings panel. You need to provide the localized strings yourself. In the translations folder, locate the JSON file for each extra language you want to support. I finally figured out you can't put raw text into "label" and "description" fields. Instead you have to add a translation key to AT LEAST the default locale in the translations directory and point "label" and "description" to that newly created key. It would be great if you could add this caveat to the documentation - it wasn't clear. It will be good idea to have examples on range, and text types. Please also document the rules that you run. We noticed, if we use "list" type with only one option, manifest won't pass validation stage (while theme is being imported after upload). It took a while to find out this which I think is decision by design (i.e a list with one option shouldn't be allowed anyway). This page would be a good place to document the limits with some example. For example, we have discussed how label field is restricted to have N number of characters. Similarly, there is a limit on number of settings, why not give an example what does a setting mean, and how do you calculate the total number of settings? At Diziana, we are having hard time to have our own settings along with what Zendesk exposes in Copenhagen? We have worked with thousands of customers, and they want more flexibility. 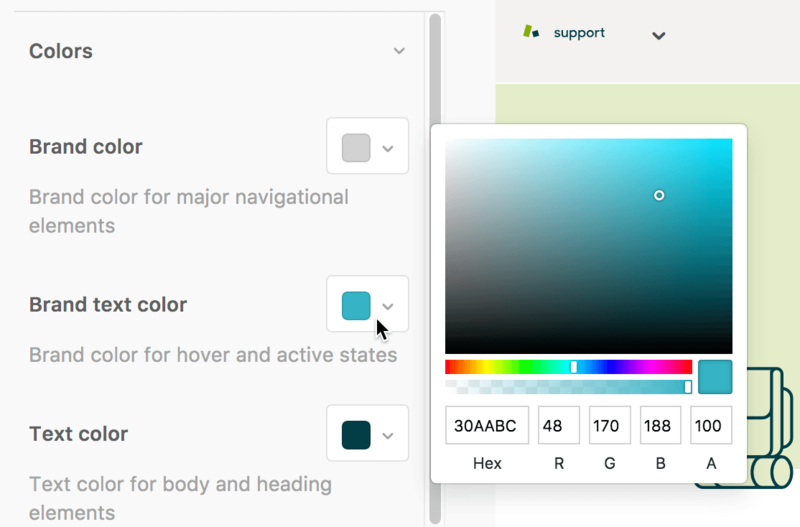 I am sure Zendesk is working to improve theming experience, I like Shopify a lot for their tools and theming experience. Please bump the limit on settings to 200-250. It's json which can be easily compressed and stored in database (if that's a concern); even parsing shouldn't cost more than a few msecs than it currently takes. 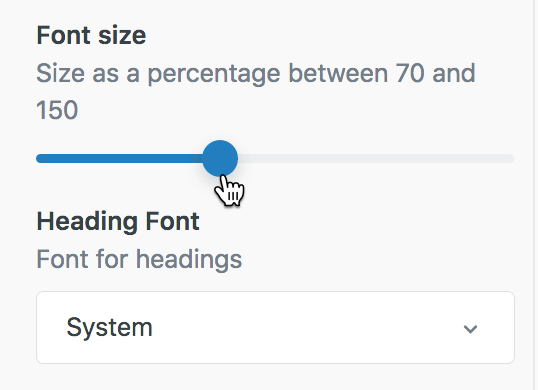 Please provide a way (a setting object of type Dynamic Content), so users can pick a dynamic content placeholder from drop-down. It's basically a list of Dynamic Content placeholders. Diziana started exposing a text-field to let customer enter DC name for multilingual text; we see Zendesk also follows similar pattern in their own help-center theme. Not having to manually type, and be able to pick from a drop-down would be super useful. Theme authors and Zendesk customers spent thousands of hours to figure out things, solve basic things, and build abstractions on top of Zendesk templating language and tools. That all can change by adding little more smartness in tools, and templating language. Once again Shopify is a good example to look at. Where do I find the `manifest.json` file? I thought it would be in the assets, but cannot find it. Again, you've caught me without the doc ready! I'm working on a Export doc. Click the options (gear) menu on the theme, then select Export. When you finished editing the manifest file, you can re-import it by clicking Import in the upper-right of the Themes page. Sorry to hear you're experiencing issues. We need to look into improving this error message. What it means is that the 1st variable of the 1st group of settings is not correctly defined. You don't need to create translations if you do not want to provide this functionality. If we can't find a translation, we will show what is set in the manifest. However, you should be aware that the label string length is limited to 40 characters, when not using the translation file. This might be the issue. Which type of setting are you trying to add? @Charles: thanks. But what about the max length of the value property for text fields? However, you should be aware that the label string length is limited to 40 characters, when not using the translation file. This limit also applies to the description field. I added to 30-character limit to the identifier property in the doc. Is this shared in the developer documentation at all? I really struggled to locate details regarding the manifest file. Is Guide really the appropriate place for technical documentation? Brad, I edited my commend to add the all-important import step, if you edit the manifest file. Okay, so there is no way to modify that single file, but rather I have to export/import to modify the manifest.json. Correct? I have a question concerning the use of the manifest.json file in parallel of SASS variables. manifest.json allows users to define default and custom variables, that you can change directly from the Guide Admin user interface (as shown in this tutorial), and that's great. But if you use SASS files for your theme, you got a _variables.scss file with the same variables (brand_color, text_color...etc). Which file override the other ? And what happens if I define some variables in my _variables.scss file, and then change them from the guide admin interface ? For more context, I work with this kind of boilerplate, that allow me to work with SASS/ES6...etc and compiles the all theme inside a /dist folder. Is there a way to make a hidden type of variables? For example, it would be good to save the media queries breakpoints which are not needed to be editable in the Theming Center? Do you really have to create a translations folder and then place all of the strings into it to get it to import correctly? That is a lot of extra work that shouldn't be required. There are examples above that do not follow this method and when I exported my theme to make alterations to it, it didn't have these translation folder/files to begin with. Would this mean I would need to export, make all of the translation changes, to get it to import again? That's right, Brad. You have to export the theme to modify the manifest file. I had exported the default, Zendesk-provided theme. I then modified it and then attempted to reupload it and then experienced the error. I created the translation file and it worked without any issues. Also, as an FYI, none of the label strings had more than 40 characters. Other users can add their support to get these ideas on the product roadmap. Hi @Brad, thanks for providing those details. I think we would need to have a look at the ZIP file to understand what the problem could be. If you are still experiencing issues, please send us a Support request with the ZIP file. We are woking on adding better error messages on import. These will tell you the exact reason why Import failed. Our vision with the Theming Center (TC) variables is to allow less experienced people to do smaller tweaks in the theme that don't require a theme developer. @Augusto, @Brand: I also got stuck here for a while, despite finding this thread and shortening my attribute lengths. In my case I discovered it was whenever I used a identifier longer than 30 chars. Thanks for the heads up on that, Devorah! I'll pass your feedback along in our Documentation team! What is the max lengh of the 'value' property in the manifest.json file for a field of type 'text' ?